148:7.2 The leader of the spying Pharisees, as Jesus stood talking to the people, induced a man with a withered hand to approach him and ask if it would be lawful to be healed on the Sabbath day or should he seek help on another day. 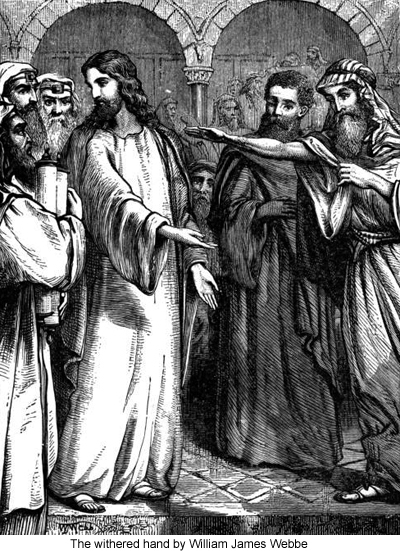 When Jesus saw the man, heard his words, and perceived that he had been sent by the Pharisees, he said: "Come forward while I ask you a question. If you had a sheep and it should fall into a pit on the Sabbath day, would you reach down, lay hold on it, and lift it out? Is it lawful to do such things on the Sabbath day?" And the man answered: "Yes, Master, it would be lawful thus to do well on the Sabbath day." Then said Jesus, speaking to all of them: "I know wherefore you have sent this man into my presence. You would find cause for offense in me if you could tempt me to show mercy on the Sabbath day. In silence you all agreed that it was lawful to lift the unfortunate sheep out of the pit, even on the Sabbath, and I call you to witness that it is lawful to exhibit loving- kindness on the Sabbath day not only to animals but also to men. How much more valuable is a man than a sheep! I proclaim that it is lawful to do good to men on the Sabbath day." And as they all stood before him in silence, Jesus, addressing the man with the withered hand, said: "Stand up here by my side that all may see you. And now that you may know that it is my Father's will that you do good on the Sabbath day, if you have the faith to be healed, I bid you stretch out your hand."